The lovely and tropical island location in the Philippines known as Boracay is an adventurer’s paradise. Everyone seems to be on holiday while on Boracay Island and this is for good reason as there is so much exciting and entertaining stuff to do. Whether it’s sailing or windsurfing or perhaps even snorkeling on many of the beautiful live coral reefs that encase this tropical oasis, there is always something to see and do while in Boracay. 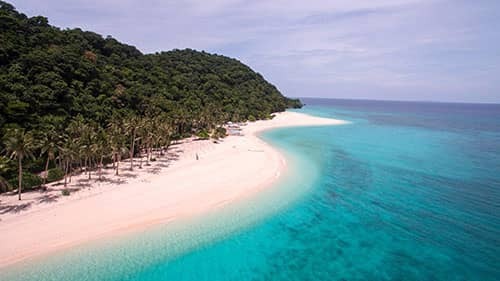 The Boracay experience starts out with the Bat Caves on the northeast coast of Yapak and ends up at White Beach, home to some of the best sunbathing in all the Philippines. While at the Bat Caves near Yapak, cave bats and the Giant Fruit Bat, that has a wingspan of an astounding 4 feet wide, regularly make food runs at twilight for their nocturnal hunt for insects and of coarse fruit. Being that there are so many caves in the area, it is natural that spelunkers and naturalists clamor to these natural wonders to see and experience some of the world’s best cave exploring opportunities. There are so many natural wonders to see and experience while in Boracay, it is best to see them in a list. Presented below is a short yet resource-filled gathering of some of the most popular tourist’s destinations and cannot-miss opportunities while in Boracay. ● The Dead Forest Very Spooky and Serene Location Sure to Put the Fright in Ya! The Island of Boracay is home to a great and varied amount of tropical wonders that are sure to excite and thrill every member of the travelling party. Many people like to rent a boat and spend the day snorkeling and discovering all that Boracay Island has to offer in the form of aquatic marine life, some of which have never been seen before by the Western vacationers. Boracay has a splendid marine preservation and is one of the most popular diving areas in Southeast Asia. Since there are so many water-sports available for the vacationer on Boracay Island, it is important that a great diving company be entrusted for the adventure of a lifetime. Lapu Lapu Diving School in Boracay is a great start for those that want to see underneath the water yet have never done so before. Lapu Lapu offers lessons in diving that will get even the novice diver up to speed in one outing! Spend some quality time with the family and relax a little while in the beautiful Island of Boracay. Looking for a smart way to travel? Get BIG DISCOUNTS from the best most affordable hotel and resorts in the Philippines, travel and tour packages, tourist attraction bookings and more! No credit card needed, pay on arrival, 100% safe and secure.